Whilst I knew ahead of time that we were all going to bring in some nibbles, myself in charge of the sausage rolls (my signature dish and always go down well at our parties), what I didn’t know was the effort that they had gone to make my last day special. The morning passed by as it normally does although looking back they found one or two extra jobs for me to complete which kept me out of their way. With the afternoon shift arriving and handover taken place a few of my colleagues who weren’t on duty arrived to wish me well. With everyone suddenly disappearing I knew this meant only one thing… it was my turn to be on the end of the party surprise. Collected from my desk by one of my colleagues I was led into one of our empty bays which they had transformed into a pink baby shower for me. I was taken back by the trouble that they had gone to and had managed to hide from me all day. With balloons and signs hung on the walls, a recliner chair placed with a big ‘mummy to be’ sign hung on it so that I would be comfortable and lots of delicious food laid out for us to enjoy. My manager had managed to sneak out of a meeting early to come back to see me off, with a little speech and a cuddle I was presented with a huge basket full of amazing baby goodies. Which took my breath away at just how generous everyone had been adding little outfits, baby essentials, smellies and toys to the basket. One of the gentlemen I work with had popped in a present earlier in the day which the girls were all eager for me to open (only fair to oblige). Upon opening it I found that he’d bought me a lovely Fisher-Price baby bouncer which was just so generous of him and I’ve requested that the girls smack his wrists for buying it for me. As the usual party planner I did feel a little awkward accepting all these wonderful gifts when I am the one usually collecting, buying and distributing the gifts. As I arrived home after the school run and brought the basket into the house Roo helped me go through all the wonderful gifts which felt like it was a never-ending basket with more and more items appearing before my eyes. 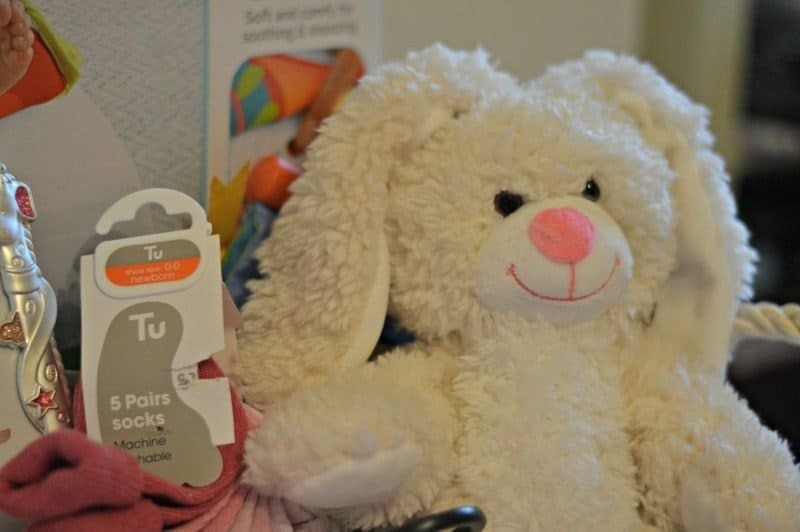 Receiving a wonderful selection outfits, socks, bibs and blankets alongside baby bath essentials and toys. I was also blessed with a box of yummy chocolates, some pampering goodies and a beautiful card which they all had added a message to and signed. Saying thank you and goodbye to everyone was difficult, I’m going to miss them all and hope that we are able to keep in touch as we all head off in different directions should our ward close as planned. Awwww! How absolutely lovely. So glad you’ve been spoilt- very much deserved! Now get those feet up for at least five minutes.